Maximilien François Marie Isidore de Robespierre (IPA: [mak.si.mi.ljɛ̃ fʁɑ̃.swa ma.ʁi i.zi.dɔʁ də ʁɔ.bɛs.pjɛʁ]; 6 Mey 1758 – 28 Julie 1794) wis a French lawyer an politeecian, an ane o the best-kent an maist influential figurs o the French Revolution. As a member o the Estates-General, the Constituent Assembly an the Jacobin Club, Robespierre wis an ootspoken advocate for the puir an for democratic institutions. He campaigned for universal male suffrage in Fraunce, price controls on basic fuid commodities an the aboleetion o sclavery in the French colonies. He wis an ardent opponent o the daith penalty, but played an important role in arrangin the execution o Keeng Louis XVI, that led tae the establishment o a French Republic. He is perhaps best kent for his role in the French Revolution's Ring o Terror. He wis named as a member o the pouerfu Committee o Public Sauftie launched bi his poleetical ally Georges Danton an exertit his influence tae suppress the left-weeng Hébertists. As pairt o his attempts tae uise extreme meisurs tae control poleetical activity in Fraunce, Robespierre later muived against the mair moderate Danton, that wis accused o corruption an executit in Apryle 1794. 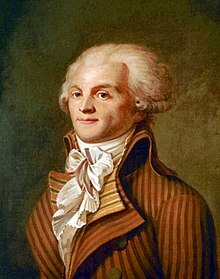 The Terror endit a few months later wi Robespierre's reest an execution in Julie, events that ineetiatit a period in French history kent as the Thermidorian Reaction. Robespierre's personal responsibility for the excesses o the Terror remeens the subject o intense debate amang historians o the French Revolution. Influenced bi 18t-century Enlichtment philosophes sic as Rousseau an Montesquieu, Robespierre wis a capable airteeculator the beliefs o the left-weeng bourgeoisie. His steidfest defence o the views he expressed earned him the nickname l'Incorruptible (The Incorruptible). ↑ Serna 2005, p. 370. ↑ Mathiez 1988, p. 63,70. ↑ Martin 2006, p. 224. ↑ Thompson 1988, p. 174. ↑ Bean, Horak & Kapse 2014. ↑ Shulim, Joseph I. (1 January 1977). Bouloiseau, Marc; Gallo, Max; Hampson, Naorman; Mathiez, Albert; Mazlish, Bruce; Rudé, George; Soboul, Albert; Forrest, Alan; Jones, Colin, eds. "Robespierre and the French Revolution". The American Historical Review. 82 (1): 20–38. doi:10.2307/1857136. Bean, Jennifer M.; Horak, Laura; Kapse, Anupama (2014). Silent Cinema and the Politics of Space (in Inglis). Indiana University Press. ISBN 9780253015075. Martin, Jean-Clément (2006). Violence et Révolution : essai sur la naissance d'un mythe national (in French). Paris: Éd. du Seuil. ISBN 978-2020438421. Mathiez, Albert (1977). "ROBESPIERRE: L'HISTOIRE ET LA LEGENDE". Annales historiques de la Révolution française. 49 (227): 5–31. Mathiez, Albert (1988). Etudes sur Robespierre : 1758–1794. Paris: Messidor. ISBN 978-2209060498. Scurr, Ruth (2006). Fatal Purity: Robespierre and the French Revolution (in Inglis). New York: Macmillan. ISBN 9780805082616. Serna, Pierre (2005). La République des girouettes : (1789–1815 ... et au-delà) : une anomalie politique: la France de l'extrême centre. Seyssel: Champ Vallon. ISBN 9782876734135. This page wis last eeditit on 5 Juin 2018, at 06:14.